Have you ever witnessed a vanishing profession? By the roadside in the town of Iguig in Cagayan Valley, we chanced upon a plume of smoke rising from behind a pottery vendor's shed. 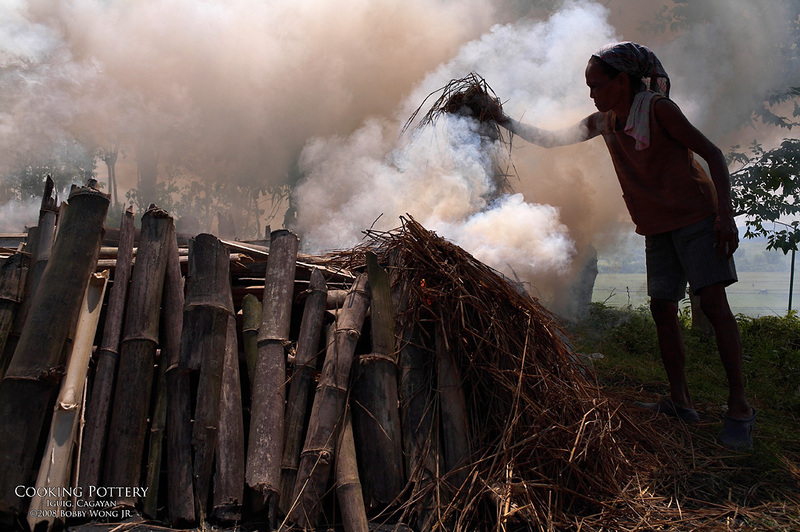 It turned out to be an open air furnace where clay pots are roasted underneath a pile of bamboo scraps and hay. The lady in the photograph is a pot cook. She darted around the fire, tossing and turning moist hay, a balancing act between feeding the flame and smothering it out. This keeps the temperature low and produces mostly smoke, conditions that magically seal the pots' pores, making them watertight and heat-resistant. Even in this day and age, we learn a lot just by watching country folk do their stuff. It occurred to me that this craft, while still common in our day, may be in danger of being lost over time. Surely, the automated furnaces of the future have little use for pottery cooks to tend the heat and smoke. A dying profession if I ever saw one, so here's hoping this photograph makes it to the future. Enjoy. As usual, a lovely photograph!! So beautiful! How do you get your photos this big? Mine always come out tiny. The lovely Jen above gave me a tip to put them on flicker, but yours are even bigger than that! I love your blog. It is so very gorgeous!!! Thank you for capturing this. What a treasure! I hope you were able to get a pot from this craftsperson. Thank you for sharing.